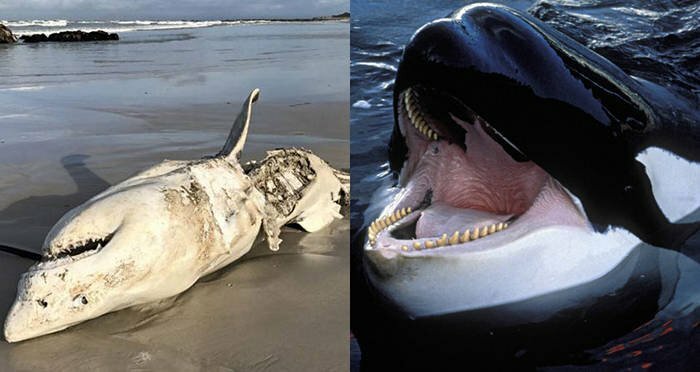 The washed up, mutilated carcasses of great whites signal a startling trend in the hunting habits of one of the sea's greatest predators: killer whales. 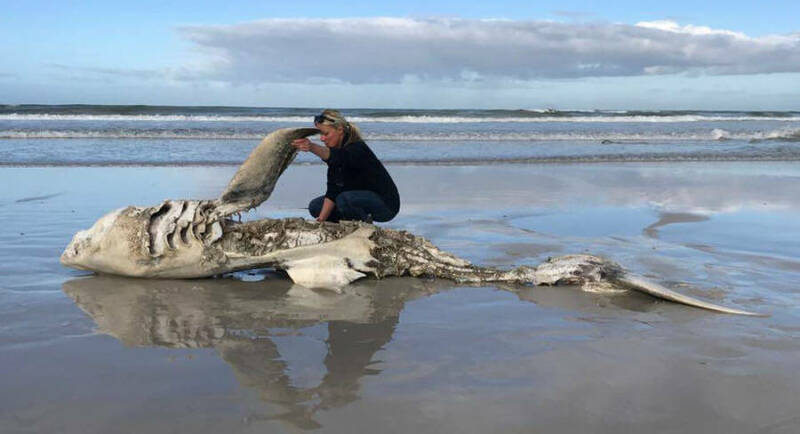 Dyer Island Conservation Trust / Marine DynamicsThe mutilated carcass of a great white washed ashore near Gansbaai, South Africa. In 2017, the bodies of five great white sharks washed up on the beaches of South Africa’s Western Cape province. The bodies ranged in size from nine feet to 16 feet, but each had large sets of puncture marks near the pectoral fins. The accuracy of these puncture wounds sent scientists into a spiral. The murderer of these sharks knew exactly where to bite to get what they wanted: each of the sharks was missing their liver. Clearly, something even more formidable had been preying on them. This was shocking, as the great white can detect a drop of blood in 25 gallons of water from three miles away. What is believed to be one of the largest great white ever seen at just about 23 ft.
Scientists determined then that only one other predator could pose such a danger to these killing machines, indeed the evidence was in their name: the killer whale. The great white shark has honed its hunting efficiency through millions of years of evolution. It has become one of the foremost killers in the sea. Though one of the world’s largest predatory fish, great whites often cannot rival an orca— or killer whale. Orcas can grow 30 feet or longer where great whites peak out at 20 feet long or just over that. A great white can close in on its prey at 35 mph in short bursts but orcas can sustain speeds of up to 30 mph with their long bodies and powerful tails. Once in range, great whites strike with rows of razor sharp teeth that are continuously replaced throughout their life. 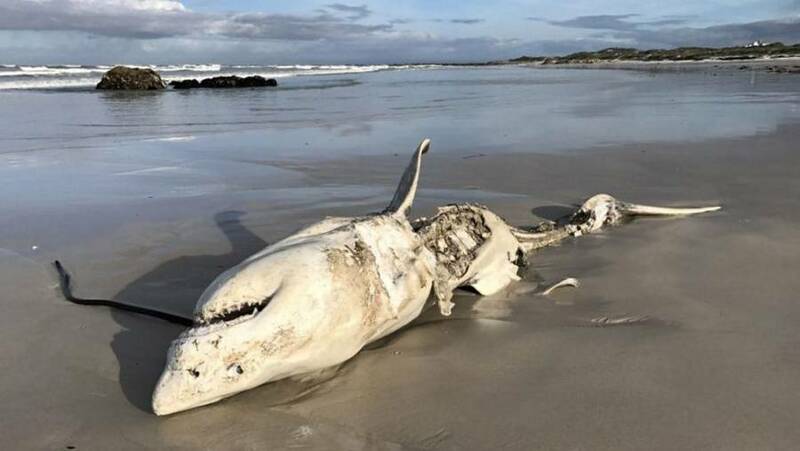 But based on the size of the bite marks on the shark’s which washed up in South Africa, it became clear that an orca had been responsible for their calculated demise. Dyer Island Conservation Trust / Marine DynamicsOne of the five carcasses calculatedly massacred by the orcas. Orcas are also apex predators and they can rival even the great white for their brutal killing efficiency. Orcas use their tremendous stamina and speed to travel enormous distances. In fact, orcas are one of the most widely-spread mammals on the planet. Like sharks, orcas have a varied carnivorous diet. They primarily target fish and marine mammals, but orcas will eat almost any animal they can get their jaws around: including seabirds. An orca was even once recorded preying on a moose. These orcas are on the hunt for seals. So it’s not particularly unusual that a killer whale might eat a shark if given the chance. What is odd is that they would target great whites, especially because these sharks are such fearsome predators. A great whites jaws are easily large enough to sever a person’s limbs with a single bite. But the orca seems to have developed a way to take on the great white safely. In 1997, an orca was seen ramming into a great white shark off the coast of San Francisco. The force of the blow stunned the shark and gave the orca the opportunity to flip the great white over and hold it in that position. Sharks are susceptible to something called “tonic immobility.” When they are held upside down in the water, sharks become paralyzed because they require water to move across their gills while they swim in order to breathe. Thus, the orca was essentially able to drown the shark before feeding on it. Orcas are exceptionally intelligent animals and can even coordinate hunting behavior in packs like wolves. They’ve proven that they can easily disarm a great white in an attack. But the question remains: why do orcas bother hunting these sharks at all? A killer whale annihilates a great white. Large predators like the orca tend to go after prey animals that have a lot of rich blubber on their body, which means that most of the shark is unappealing as a meal. Certain parts of a shark, however, are appealing to killer whales. In each of the documented attacks, the orcas have made extremely precise bites on the sharks. Primarily, they target the livers, stomachs, and testes of the sharks. And this might actually explain what’s going on. Sharks’ livers have very high concentrations of oil and fats. They are also very large compared to other animals. This potentially makes a great white’s liver one of the best sources of quick energy in the ocean. Orcas seem to have learned this and are targeting sharks specifically for their nutrient-rich livers. There are documented accounts of killer whales targeting sharks that date back decades. It’s possible even that great whites may have been part of the killer whale’s diet well before then. But the rising frequency of the attacks is a new development. Some scientists suggest that the answer could be the changes in the relative ranges of the animals. Shark populations have been growing due to restrictions on fishing. Global warming is expanding the geographical areas these sharks can live in. 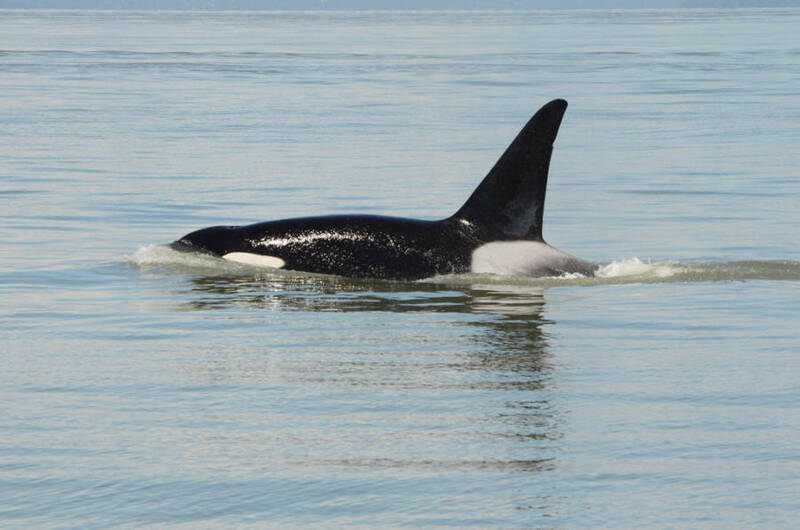 So sharks and killer whales may simply be sharing the water in close proximity more often. More gravely, it could be that killer whales are running out of their usual source of nutrition and are instead turning to great whites as an alternative meal. The good news for sharks is that they seem to be learning to adjust to the threat. Sharks have been seen leaving areas when they know that there are killer whales nearby. And in case you’re worried about your own safety, killer whales and great whites alike rarely attack humans. Next, read about groups of killer whales attacking Alaskan fishing boats. Then, check out why you should be more afraid of a mako shark than of a Great White.